Submerge your cedar plank in water anywhere from 20 minutes to 4 hours, depending on the thickness and your timing. Preheat the grill over a medium high heat. Trim asparagus and lay in aluminum foil. Drizzle over balsamic vinegar and 1 Tablespoon of the olive oil; wrapping the foil to cover. Place the asparagus package on the cedar plank, reduce the flame and close the lid of the bbq. Grill for about 10 – 15 minutes, checking intermittently until tender. Meanwhile, heat the remaining oil in a large stockpot to sweat the leeks and garlic until soft and translucent but not browned; about 3 – 5 minutes. Remove the best spear tips from the asparagus and reserve for garnish. Roughly chop the remaining smoky asparagus, add to the simmering soup. Continue for another 3 – 5 minutes to cook through to merge flavours. Transfer soup to a food processor or using a immersion blender, combine until smooth. Season to taste with salt. Stir in lemon juice, if using. Top each serving with reserved asparagus tips and drizzle over extra virgin olive, basil or leek oil. Cedar planks, not just for salmon anymore. Guests came to celebrate spring and for that, we spark the BBQ. It might still be a bit early to eat outside, but who can resist the flame that is the official call of nicer weather? Having grilled on cedar planks before, I’m already fond of the fantastic smell and extra flavour it lends to food. They seem to be gaining in popularity so finding a board isn’t nearly as difficult anymore as most grocery stores with a fish department tend to carry them. 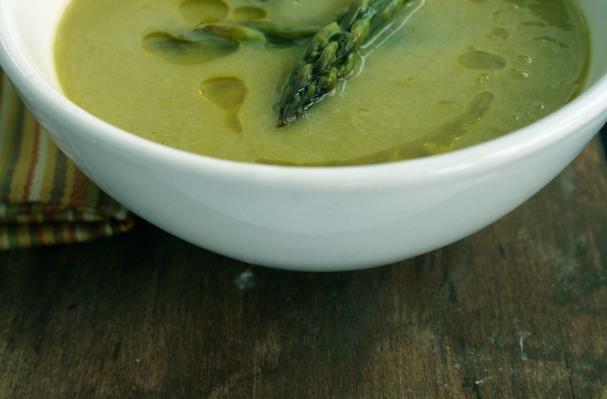 The idea for the smoked asparagus soup came a little haphazardly. I was planning on grilling the asparagus with a drizzle of balsamic and olive oil but as it was the first grill of the season the flames were uneven and the safest place not to char my freshly picked spears was up on the board. The soup came from the left overs of the greedy three bunches that I decided to cook up for a dinner of four. The flavour was subtle and amazing. A perfect enhancement for an already pretty great vegetable.